After the death of the visionary and founder of Apple, Steve Jobs, everyone wondered who could replace him. Not to replace him as CEO of Apple because of Apple's Tim Cook has been appointed to the post. Steve Jobs is famous for its charm, genius, and the vision of its future. The character and nature of Jobs that is the focus of everyone so that begs the question, who is "The Next Steve Jobs". That question will likely be missed. In a technology-sharing event TEDx ManhattanBeach, a child who is still sitting in sixth grade elementary school look stunning when presenting the product's creation and his startup company to the audience. 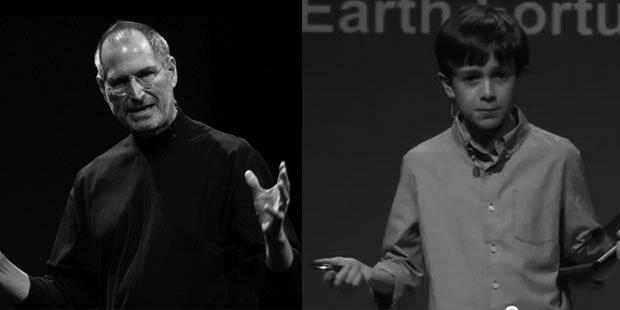 He was confident and had a body language that reminds the public of the late Steve Jobs. This boy named Thomas Suarez, a 12-year-old boy from California, USA. He is the founder of a startup company CarrotCorp which is currently developing applications for Apple's IOS operating system. As quoted by the Daily Mail, Thomas Suarez was indeed an admirer of Steve Jobs. He has been interested in making a computer program since kindergarten and taught himself several programming languages​​, like Python, C, and Java. His first works, namely Earth Fortune, present at the end of 2010, a program that allows changes color based on the fortunes of the Earth's users. Currently, Thomas remain focused studying at school while still managing the company's formal CarrotCorp. In his presentation at the TEDx, he was describing the products produced by his company's startup. In addition to amaze those who attended, Thomas also made a curious public by exhibiting a tagline that reads, "Uploading the pictures will never be. Coming soon". Is Thomas Suarez can replace his idol, Steve Jobs? At least he has the potential to go that way. This is appearance of Thomas Suarez in ManhattanBeach TEDx event.